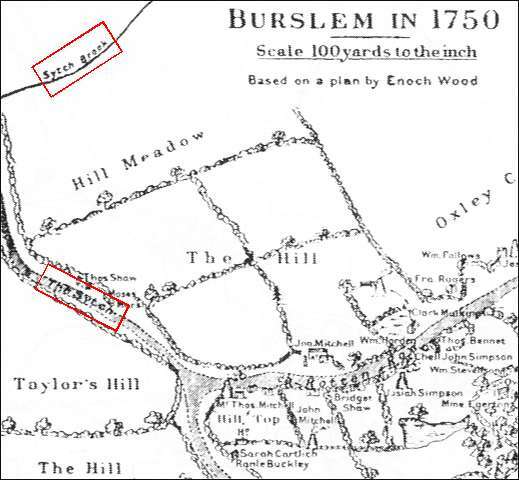 This part of Burslem was know as 'The Hill' for centuries - a 1750 map shows 'Hill Meadow', 'The Hill', 'Hill Top', 'Taylor's Hill'. When the Hill Works were built in 1814 by John and Richard Riley (see this link) there was an existing works on the opposite corner which was occupied from 1828 by Samuel Alcock. In 1839 Alcock rebuilt these works into the Hill Pottery shown here. Confused? There were the Hill Works of the Riley brothers and the Hill Pottery built by Alcock - they were on opposite corners of a road junction. The names of the pottery factories was used interchangably by some and so the Alcock's factory would also be called the Hill Works (as was the Riley factory). Additionally both factories had a number of sucessive occupiers who all traded under different names. To add to the confusion the Alcock's works was later divided into china and earthenware sections. Sometimes there were more than one company operating from the works at the same time. "The Hill Pottery of 1839 was designed by Thomas Stanley, a Shelton architect, who also designed St.John's Church and school in Goldenhill and St. Thomas's church in Mow Cop. The street range of the works had the by now traditional Venetian window and pediment over. 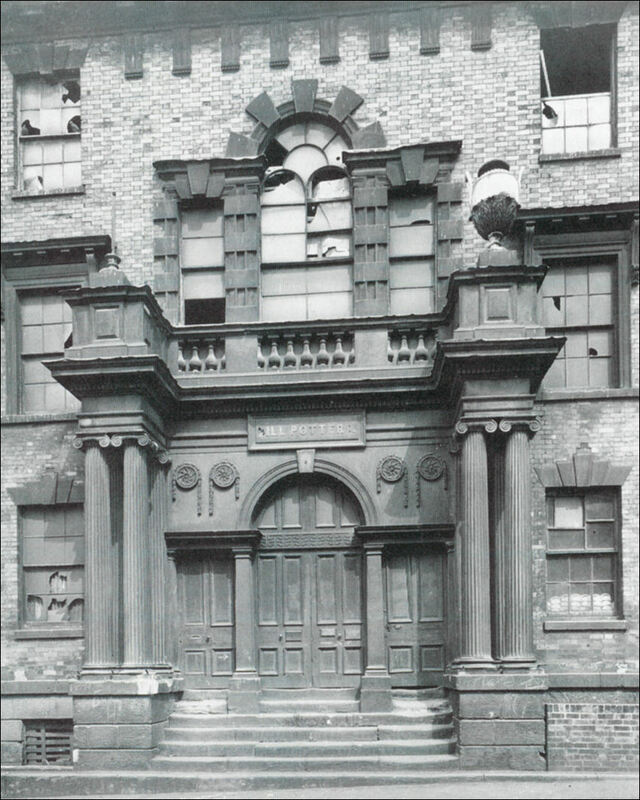 There, however, the similarities ended; the façade being far more ornate than those of any of its predecessors, the decoration was designed to focus attention on the near central entrance bay. This emphasis was provided by an unusually elaborate entrance, surmounted by a tall Venetian stair window, pediment and cupola with flag pole. The entrance was flanked by pairs of fluted Ionic columns which supported the projecting ends of the first floor balcony. The entrance itself took the form of a tripartite opening, echoing the Venetian window above. In contrast, the treatment of the bays to either side of the entrance was relatively restrained, ornamentation being restricted to the chamfered stone voussoirs of the ground and second-floor windows, and the hood moulds of the first-floor windows." "This factory is one of the largest and best conducted in the Potteries. The recent building, comprising the show and ware-rooms, painting, and burnishing rooms, with offices, &c. is of an elegant design ; the rooms are very lofty , spacious, well ventilated, and healthy ; most of the workshops in other parts are of a similar kind with others." Messrs. ALLCOCKS' Earthenware and China Factories, Burslem. I am an apprentice to Mr. Allcock, as a burnisher. Have been bound 12 months. There are three apprentices, and 30 or 40 young women working in the same room with me ; the three are under 13 years ; most all the women served their time here. We have no men or boys in the same room with us. There are three superintendents looking over us; they are very kind to me sometimes: sometimes they give me a slap upon the back when I look off; my work ; that is all the punishment I get, except a scolding. I never forfeit pay for breakages. I get rewarded sometimes with a penny, when I'm a good girl; the burnishers give it, not the master. I get 1s, or 1s. 6d. a week, and carry it home to mother. She stays at home to look after the children : she has five. I can read and write a bit; not much. I go to Sunday school ; went to a day school afore I came. I like my work very well, and should not like to leave it. I am an apprentice to the company as a burnisher; have served one year; we are bound for six. I ought to come in the morning at six, to sweep out, but sometimes come as late as seven; then I have to pay 2d. to another. We do this work in turns, 20 of us. I go home at different times; it depends upon what I have to do. I don't know how much work I do; but when there's plenty I carry home 2s. Saturday nights: I give it to mother; she stays at home. Father is a gilder, and works here. I have one brother and three sisters. I can read, but cannot write : my brother can read, my sisters cannot. I go to chapel school twice a day. I am a paper cutter for Mary Sergeant; she is employed by Samuel Sergeant, the printer, who is her husband. We have two pressmen, two girls, and four women working with me in the same room. I have been to work three weeks next Tuesday. Can read, but cannot write. Went to day school at Mrs. Williams's; go every Sunday to Baptist school. I come to work at half-past six ; get my dinner in the same room in which I work ; never hear bad language there ; never hear swearing I go home at six o'clock, or half-past. Work Mondays, when there is work to do. Did not work last Monday. Samuel Sergeant is a very good man. I get now 2s. a week; shall have 3s. soon. I always take it home for my mother. My father is a slip-maker; mother stops at home to look after the young ones. Have two sisters and one brother; one of my sisters is older than I am; she is a transferer. Samuel Alcock (b.1799 – d.1848) was a leading pottery manufacturer based in Burslem - though from a farming background, he developed an interest in commerce after working with his uncle Joseph Locker, a grocer and banker of the Market Square, Hanley. His introduction to pottery came when he embarked upon a partnership with Ralph Stevenson of Cobridge, Staffordshire. By the 1830s Stevenson employed 600 people at his works. 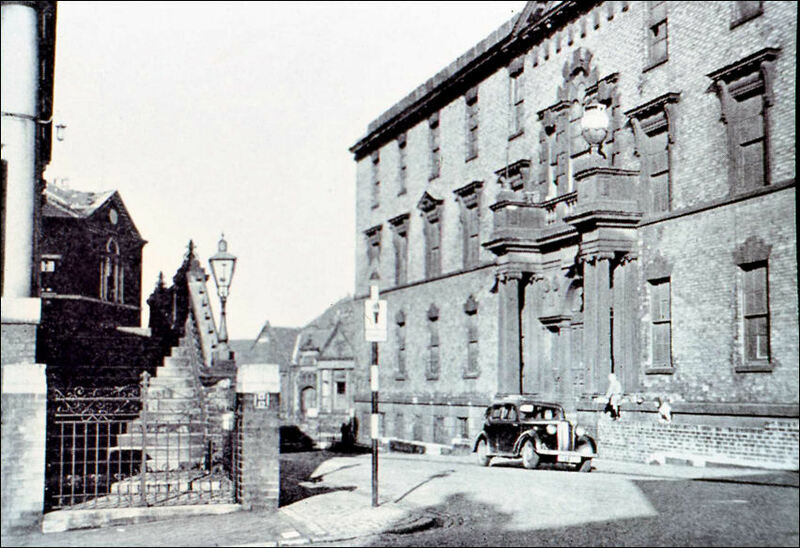 In 1828, Alcock developed his own business and began work on the Hill Top site in the Sytch, Burslem. 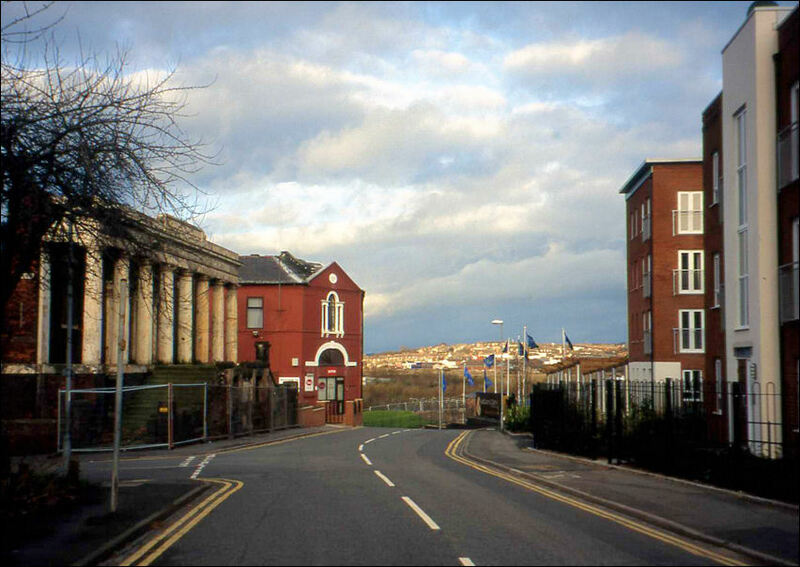 In 1839 he completed work on a large factory, built in the Venetian style, on the junction of Westport Road and Greenhead Street. 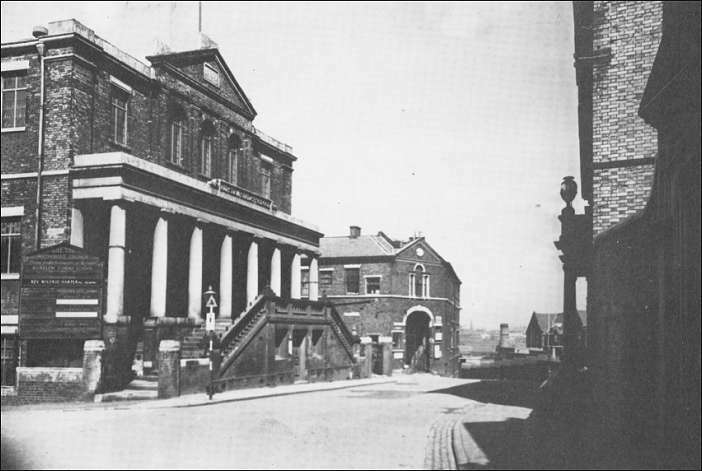 In 1836, Alcock was appointed improvement commissioner for Burslem and in 1842 was elected chief constable for the town. In this post he took an important part in quelling the Chartist Riots. The town of Burslem was fortunately prepared for a proper reception of the Banditti. A small troop of the 2nd Dragoon Guards had arrived there from Newcastle, under the command of Major Trench, and a large body of volunteers, from among the friends of law and social order of all classes of society, had been hastily organized as special constables, by the praiseworthy exertions of Samuel Alcock, Esq., the chief constable of Burslem. In November 1848 Samuel Alcock died and his works closed around 1859. The novelist Arnold Bennett called the Hill Pottery works "Sytch Pottery" in the Clayhanger book. detail of the front entrance from "Potworks"
"When they had crossed the windy space of St. Luke's Square and reached the top of the Sytch Bank, Mr. Orgreave stopped an instant in front of the Sytch Pottery, and pointed to a large window at the south end that was in process of being boarded up. "That's the most beautiful window in Bursley, and perhaps in the Five Towns; and you see what's happening to it." Edwin had never heard the word 'beautiful' uttered in quite that tone, except by women, such as Auntie Hamps, about a baby or a valentine or a sermon. But Mr. Orgreave was not a woman; he was a man of the world, he was almost the man of the world; and the subject of his adjective was a window! "Why are they boarding it up, Mr. Orgreave?" Edwin asked. "Oh! Ancient lights! Ancient lights!" Edwin began to snigger. He thought for an instant that Mr. Orgreave was being jocular over his head, for he could only connect the phrase 'ancient lights' with the meaner organs of a dead animal, exposed, for example, in tripe shops. However, he saw his ineptitude almost simultaneously with the commission of it, and smothered the snigger in becoming gravity. It was clear that he had something to learn in the phraseology employed by architects. "I should think," said Mr. Orgreave, "I should think they've been at law about that window for thirty years, if not more. Well, it's over now, seemingly." He gazed at the disappearing window. "What a shame!" "It is," said Edwin politely. Mr. Orgreave crossed the road and then stood still to gaze at the façade of the Sytch Pottery. It was a long two-storey building, purest Georgian, of red brick with very elaborate stone facings which contrasted admirably with the austere simplicity of the walls. The porch was lofty, with a majestic flight of steps narrowing to the doors. The ironwork of the basement railings was unusually rich and impressive. "Ever seen another pot-works like that?" demanded Mr. Orgreave, enthusiastically musing. "No," said Edwin. Now that the question was put to him, he never had seen another pot-works like that. "There are one or two pretty fine works in the Five Towns," said Mr. Orgreave. "But there's nothing elsewhere to touch this. I nearly always stop and look at it if I'm passing. Just look at the pointing! The pointing alone..."
Edwin had to readjust his ideas. It had never occurred to him to search for anything fine in Bursley. The fact was, he had never opened his eyes at Bursley. Dozens of times he must have passed the Sytch Pottery, and yet not noticed, not suspected, that it differed from any other pot-works: he who dreamed of being an architect! "You don't think much of it?" said Mr. Orgreave, moving on. "People don't." "Oh yes ! I do!" Edwin protested, and with such an air of eager sincerity that Mr. Orgreave turned to glance at him. And in truth he did think that the Sytch Pottery was beautiful. He never would have thought so but for the accident of the walk with Mr. Orgreave; he might have spent his whole life in the town, and never troubled himself a moment about the Sytch Pottery. Nevertheless he now, by an act of sheer faith, suddenly, miraculously and genuinely regarded it as an exquisitely beautiful edifice, on a plane with the edifices of the capitals of Europe, and as a feast for discerning eyes. "I like architecture very much," he added. And this too was said with such feverish conviction that Mr. Orgreave was quite moved." In 1840 the House of Commons set up a commission to inquire into the state of children employed in the mines and manufactories. Samuel Scriven visited the area of Stoke-on-Trent from December 1840 onwards to collect evidence. The eighteenth century saw the development of the North Staffordshire pottery industry from a cottage industry to a major exporting industry. The connection was the packhorse road from the Fountain Place works of Enoch Wood in Burslem, though Longbridge (now Longport) and onto to Newcastle. 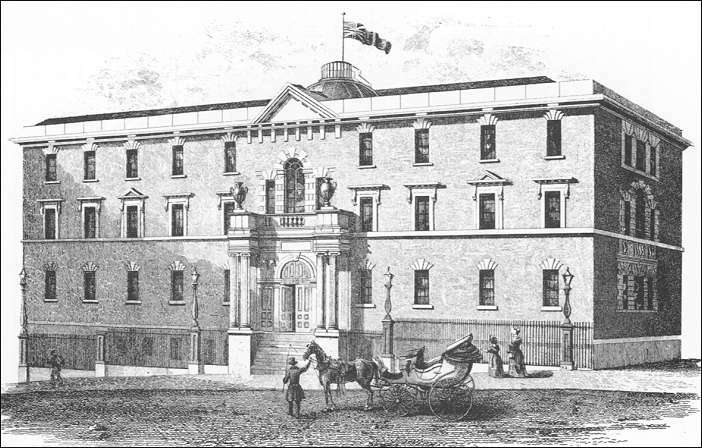 This impressive building was built in 1836 on the corner of Westport Road and Hall Street.